How to get rid of moles in yard? Home Diseases And Pests How to get rid of moles in yard? Getting your grass into top condition takes a lot of work, so the last thing you want is to wake up one morning, open the curtains and see the untidy mounds of earth that tell you moles have been at work underneath your lawn. For such small animals moles can cause incredible havoc, and if they move into your yard you need to get them out again as fast as possible. Unfortunately that’s easier said than done – they can be incredibly difficult to shift unless you know exactly what you’re doing. Here’s a handy guide to getting rid of moles before they get rid of your garden. Moles are small mammals that have evolved to live almost permanently underground; they have small eyes (although they’re not quite blind) but excellent senses of hearing and touch. They can hunt small invertebrates by smell or by sensing the tiny vibrations they make. Moles can be valuable, because they eat many species of grubs that mature into harmful insects – they’ll happily snack on the larvae of Japanese beetles, for example – but their favorite food is earthworms, which are highly beneficial for your garden. That’s not the worst of it though. Moles live in tunnels running just below the surface, which they can dig very quickly with their powerful front paws. A single mole can excavate 75 feet of tunnel in a day, and all the earth they disturb has to go somewhere. A lot of it gets pushed up to the surface, either as ridges above the tunnels or mounds of loose dirt, and that can make a real mess of your lawn. If you want to keep your garden in good shape the moles have to go. There are a few ways to keep moles out of your property in the first place. One is to get rid of Japanese beetles, which you should be doing anyway if you have any. The other is to build a mole barrier. This isn’t easy, because of course moles travel underground, but it is possible. The thing about moles is they don’t like coming aboveground if they can help it, so an underground barrier is an effective deterrent. If you dig a trench a foot wide and two to three feet deep along any exposed edges of your property, fill it with gravel and cover the top with soil, most moles will turn back at your boundary. You can also build a fine mesh fence at the bottom of the trench then fill in around it, but using gravel is simpler and will give you some extra drainage too. If you have long boundaries a gravel barrier can be a lot of work and expense, so you may be tempted to try other ways of deterring moles. There’s a wide range of chemical repellants on the market but not a lot of evidence on how effective they actually are. Standard small animal repellents probably aren’t going to do much, but some claim to be specially developed for moles. Many of these are based on castor oil, and you can mix up a cheaper version at home. Put a quarter cup of castor oil and two spoons of dish soap in a blender, add a quarter cup or water and whizz until it’s thick and foamy. Store it in a jar until you need it. Then mix two tablespoons into a gallon of water and pour on any areas where moles are active. You can add ground red pepper or hot pepper sauce for some extra security. Because moles are sensitive to sound they might be driven away by vibrations. Ultrasonic repellers don’t seem to bother them, but positioning wind spinners near the tunnels can be effective. If you don’t succeed in persuading the moles to move away more drastic measures might be required. If you really don’t want to kill them you can try flooding them out. Find a tunnel entrance, or dig down into the burrow, and feed the end of your hose in there. Then turn the water on and wait to see what happens. Unless your yard is very well drained the tunnel should soon fill up, and that will drive the moles out. You can catch them by dropping an inverted bucket over them when they emerge, then drive them a few miles away and release them. Another non-lethal message is a live trap. You can buy traps that will harmlessly catch a mole, or you can build your own. To do this find an active tunnel and dig down into it. Excavate a pit just large enough to hold a plastic bucket with its rim below the tunnel, then lay a sheet of plywood or card over the trap to keep the light out. Any mole trying to get through that tunnel will fall into the bucket and won’t be able to climb out again. Check the trap every day, and release any moles well away from your home. The last resort is to kill the moles. You can try gassing them; rodent smoke bombs or gas cartridges will kill moles. A safer way is to drop lumps of dry ice down ever tunnel entrance you can find. Dry ice is just frozen carbon dioxide, and as it heats up it returns to its gas state. This will fill the tunnels and asphyxiate the moles. The most effective, but messiest, way to kill moles is with lethal traps. There’s a wide selection of these, and they kill in a variety of ways. Some snare the moles, some chop them in half with a blade and others impale them with a spring-loaded spike. All are rapidly lethal but not very pleasant to clean up. Standard mouse traps will also kill moles. If you do use lethal traps check them daily, and if they haven’t caught anything move them to a new location – empty ones were probably placed in an inactive tunnel. 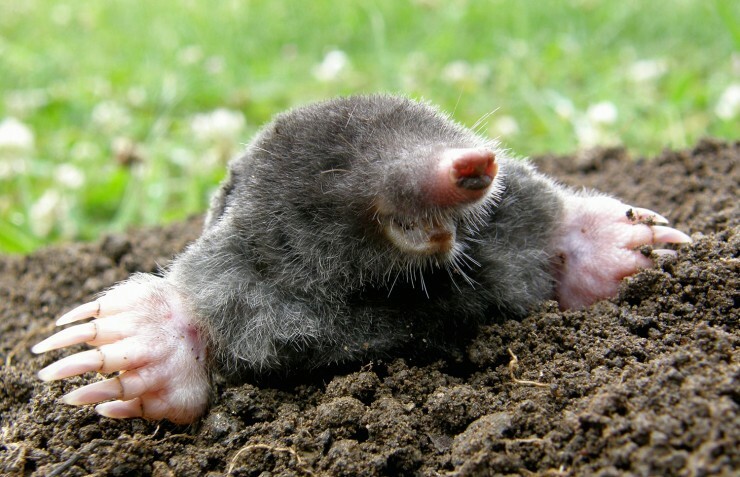 Moles are a stubborn pest, but you can get rid of them with the right techniques. Non-lethal methods are less reliable and take longer to work but if you don’t want to kill the moles it’s still possible to at least reduce the problem. In any case leaving them isn’t really an option unless you want your whole yard turned upside down.